potentially nervous: let the people decide! we have a little argument brewing on over here at PN. it's perhaps an east coast, west coast thing. or maybe it's bunnydaddy verses bunnymama. i thought i picked the best photo of nibs that his manslave had sent me...but when he saw it he thought i should have used one of the others. i'm not telling you which one. so he and i, well we decided to call a truce and let you decide. of these three images of nibs with the new screen saver, which do you like the best? 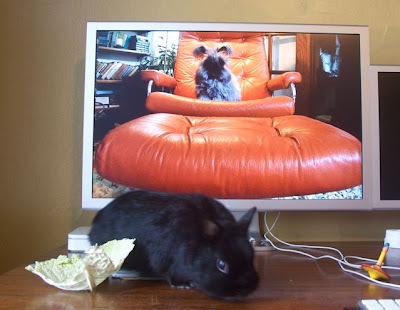 oh yes and if you're looking at these crops of the bunnies on the screen that's part of it, as they come into view they recess and increase in size fading into one another. we're trying to get nibs to make an infomercial for youtube of it since he has the nicest monitor we've come across so far. I like this one the best. Fat's is saying, "Nibs, tell me more about your desires to run away." I can only see one photo. How can I see the others? malcolm really???? you only see one photo? are you looking at the whole blog? or did you just click on the newest post? looks like i'm going to have to drop what i'm doing and email you. then you'll be forced into voting for my photo choice! You're right - I went to the main blog address and they all came up. Nadine and I both agree entirely that the first one of Fats on the chair (looking like a Bond villain) is the clear winner. Put down two votes for this one! This one gets my vote. Fats looks so omnipotent here, and Nibs assumes the appropriately meek demeanor. Mickey and I vote for Fats in the orange chair--it's one of our favorites!